Above: Dramatic view of the Cache Valley Inversion 2/2/13. The inversion continues and like most things looks better or worse depending on the day and the hour. As a newer resident I am shocked at how disgusting the air can be. At times you can taste it in your mouth for 30 minutes after you have come inside. I’m fortunate to live on the bench and am above the thick part of it most of the time. Visually the inversion can be stunning and enjoyable to photograph. I prefer drama to a clear blue sky any day. Above: USU and Cache Valley inversion 2/3/13. 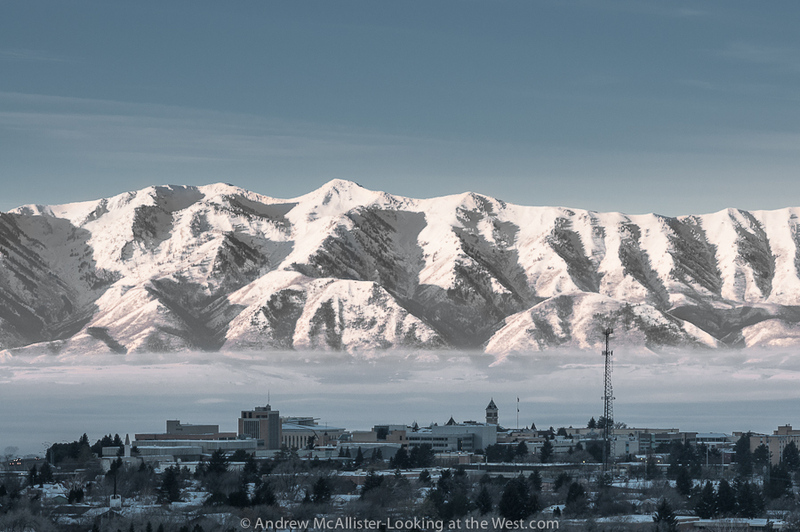 A closer view with USU, the Wellsville Range and some pollution in-between. Taken at the beginning of another red air day. Above: A wider view from the same morning. I really hope that Cache Valley can get a grip on the pollution. I was shocked when I first moved here at the number of diesel pickup trucks that treat every green light like the beginning of a race or some contest to see who can spew the largest cloud of black soot onto the intersection. The pollution problem is large and more complex for sure and I am no expert. It will be interesting to see if Logan and Cache Valley can meet EPA requirements by 2014. If my images or distinct vantage point can be of use to people working on the inversion problem please contact me I’d love to help out.